Nexstim is committed to exploiting the commercial opportunity for its proprietary Navigated Brain Therapy (NBT) system in the rapidly growing depression market. The negative E-FIT stroke trial has closed the door on pursuit of stroke rehabilitation, necessitating a shift in strategy and resources towards commercialisation of NBT in major depressive disorder (MDD) in the US and Europe. First installations have occurred in multiple sites in the US, Europe and Asia, with the strategy to support further roll out across the US being advanced. We have revisited our forecasts and valuation to reflect Nexstim’s depression-led strategy, and now value the company at €35.9m, or €0.37/share (€0.34/share diluted). TMS in MDD is not uncharted territory Use of rTMS (repetitive Transcranial Magnetic Stimulation) in MDD is well documented and reimbursed (in both Europe and the US). Nexstim’s proprietary rTMS platform is differentiated by its ability to navigate precisely, reliably, and reproducibly. These features should translate into improved treatment efficacy given the ability to accurately target the Dorso-Lateral Prefrontal Cortex (DLPFC) 100% of the time vs c30% by non-navigated TMS. MDD is a commercially attractive opportunity Management intends to maximise the commercial opportunity of the depression indication, a sizeable market in both the US (FDA approved ) and Europe (CE marked) of c6m patients and a total treatment value >€40bn. A high annual revenue stream per system is targeted with high utilisation rates at TMS centres and psychiatric centres. Nexstim will leverage the existing neurosurgical KOL network developed in pre-surgical brain mapping. First installations for depression at multiple sites Since direct US commercial launch in May 2018, multiple systems have been delivered to customers. Potential for improved clinical outcome, existing reimbursement, and the prospect of rapid treatment time (post-approval for the recently filed 510(k) for 3-minute therapy) means the healthcare economic proposition is compelling. In Europe and Asia, a mixed direct and distributor model is being deployed; the new distribution deal for Hong Kong underlines progress in developing new markets. 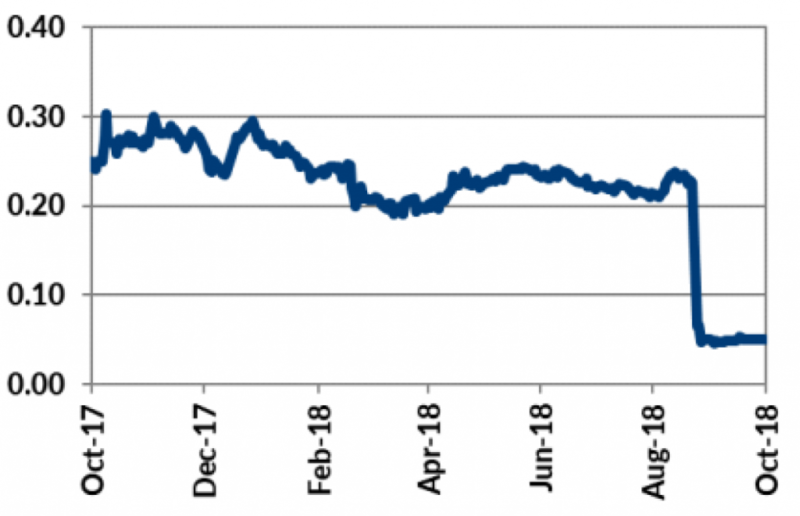 MDD focus supports €35.9m valuation We have updated our model given clarity in the new strategic direction, the commercial potential in MDD, and associated funding requirement (end-June cash of €10.3m provides a c12 month runway at current burn rates). 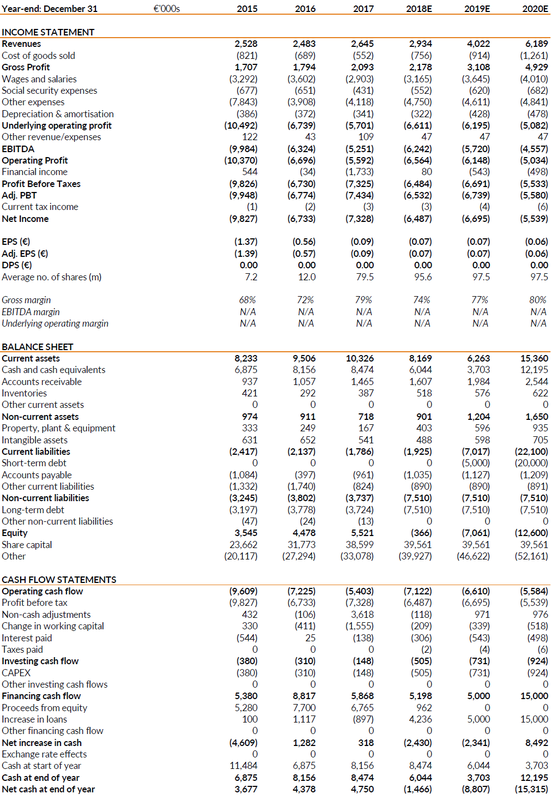 Employing a risk-adjusted DCF and conservative assumptions, we value Nexstim at €35.9m or €0.37/share currently and €0.34/share diluted. Why is depression such an attractive opportunity? Nexstim management have outlined a depression-led corporate strategy following the disapointing results of the E-FIT stroke rehabilitation study. The focus is now on maximising the commercial potental of its highly accurate TMS (Transcranial Magnetic Stimulation) system as a therapy for depression. Nexstim’s TMS imaging systems (used for either diagnostic and therapeutic applications) have extensive validation (including FDA approvals) and have been shown to be highly accurate and clinically effective in mapping the cortical motor areas. Nexstim’s decision to focus on depression, particularly Major Depressive Disease (MDD), is driven by several important considerations. Treatment resistant depression (ie unresponsive to pharmacological anti-depressant medication) has a current addressable market of c6m patients but is growing rapidly. Use of repetitive TMS (rTMS) is accepted as a second-line therapy, with the first FDA approval occurring in 2008 (Neuronetics’ Neurostar focal iron core coil TMS platform). It is also reimbursed in the US and various European countries. The use of rTMS systems for MDD allows for stimulation of the left dorso-lateral prefrontal cortex (DLPFC) of the brain without the adverse effects associated with electroconvulsive or pharmacological augmentation therapies. It has been shown to be effective in the real world as well as the more rigorous clinical setting. Importantly, rTMS is a simple and straightforward out-patient treatment so can be used in an office setting, without any need for anaesthesia or fear of serious adverse effects. While these features mean that rTMS is rapidly gaining traction as a treatment modality for MDD, there are also limitations. These are primarily connected to the variability in targeting and stimulating the DLPFC (the region of the brain associated with abnormally low levels of activity in MDD patients) both between patients and within individual patient treatment sessions. Accurate navigation could materially improve treatment outcomes, and this is where Nexstim’s technology has a clear competitive edge over prior devices. Nexstim’s Navigated Brain Therapy (NBT) system ‘SmartFocus’ was FDA approved for MDD in December 2017 and was launched in the US in May 2018. It is the only FDA approved device with built-in navigation, ensuring accurate and reproducible treatment. This is achieved through precise mapping of the motor cortex, and via proprietary e-field modelling to account for distortion caused by bone and brain tissue, accurately visualising the exact location, orientation, and magnitude of the stimulation. This means NBT can target the DLPFC 100% of the time vs 30% with other TMS approaches. Early indications are that the benefits of accurate navigation are readily understood by clinicians. The commercial priority for Nexstim is raising market awareness of its NBT system, as it will be the growing appreciation of the value proposition (in terms of patient outcomes and the economic benefit to clinicians) that will be the main driver of uptake. Management has articulated its commercial plans for MDD and is making investment in marketing infrastructure, as well as additional technology and business development initiatives to further strengthen its offering. We explore these plans and recent achievements in this respect later in this note. Nexstim’s TMS platform and business strategy falls into two related albeit commercially separate divisions: Diagnostics and Therapeutics (Exhibit 1). The diagnostics division comprises the Navigated Brain Stimulation (NBS) system used and extensively validated in pre-surgical brain mapping, while the Navigated Brain Therapy (NBT) system has been optimised for therapeutic use. To date, most commercial traction has been gained in the more established use of NBS as a diagnostic in pre-surgical mapping (PSM). NBS provides greater mapping precision, allowing surgeons to be more aggressive in tumour resection, thus improving treatment outcomes. The NBS system was launched in 2003, with marketing efforts targeted at universities and teaching hospitals with a strong key opinion leader (KOL) presence in neurosurgery and radiology. It has subsequently attracted an impressive client list, which routinely uses the tool in pre-surgical mapping. The global installed base is over 150 NBS systems, including numerous world-renowned cancer centres (eg Mayo Clinic, MD Anderson, Charite, Great Ormond Street Hospital, and UCSF). Management intends to continue to support growth in this high-margin diagnostic application but also recognises that the true commercial potential of TMS lies in therapeutic use. This is a commercially separate market, albeit with potential to leverage the neurosurgical KOL network. The intention is to focus on two currently poorly addressed indications: depression and chronic neuropathic pain. Exhibit 2 overleaf summarises Nexstim’s commercial assessment for NBT in these indications. Chronic neuropathic pain is currently the largest application segment in the neuromodulation market, but, despite its lower incidence, the consensus is that depression the major opportunity for medium-term growth. While Nexstim’s NBT is CE Marked for chronic neuropathic pain, the FDA has yet to approve any rTMS device for this indication. This largely reflects the fact that no large, multi-centre, randomised clinical trials have yet been undertaken by any manufacturer. Following encouraging results from an exploratory 39-patient Phase II study at The Walton Centre, Neuroscience Research Centre, Liverpool (detailed in our Initiation note), Nexstim is currently evaluating potential clinical trials for pain. The rate of adoption of rTMS in MDD is currently low (as Neuronetic’s experience over the past decade highlights), but a growing body of clinical evidence and health economics studies is building which is increasing the momentum in clinical uptake. Nexstim has identified various initiatives to boost visibility and uptake of NBT as part of its new strategy and planned commercial activities. Source: Nexstim. Note: 2 = PMSI Consulting analysis, expert interviews and estimates. Operational excellence to maintain margins, including logistics with seamless delivery. Further development of the US commercial customer service will contribute to this. Nexstim has a clear strategy for NBT commercial roll out in the US, with a focus on TMS centres and high volume psychiatric practices in four key regions of the country (Exhibit 3). A direct sales organisation, initially totalling 16 individuals, is being built, comprising the existing US infrastructure for NBS as well as new specialist hires across various disciplines, including account management, clinical applications, customer service, reimbursement and product management. There is potential to leverage the current installed base of NBS systems, which could be used to demonstrate the capabilities of Nexstim TMS and the user experience. Additionally, current customers can act as advocates and contribute to patient registries. However, the main selling point is likely to be centred around greater cost savings and better outcomes with use of NBT. Cost effectiveness studies have shown that introduction of rTMS treatment after a single failed antidepressant treatment round produces greater cost savings and better outcomes than the current practice of continuing successive medication rounds. This supports wide reimbursement of rTMS in the US for MDD, with 100% Medicare coverage and coverage by most major commercial payors. CPT (Current Procedural Terminology) codes are available for both therapeutic rTMS treatment and subsequent delivery and management per session. Treatment with rTMS usually comprises daily out-patient sessions lasting about 30 minutes, typically for 2 to 6 weeks. The treatment process first involves localisation of the DLPFC (hence Nexstim’s record in pre-surgical mapping is highly pertinent), and then delivery of a magnetic pulse. Accurate navigation and the reproducibility of the process (Exhibit 4), with precise and consistent DLPFC stimulation, should result in improved outcomes with Nexstim’s NBT device. This coupled to a compelling economic case for individual TMS Centres and Psychiatric Clinics/Hospitals (Exhibit 5) should contribute to an increasing rate of adoption. Nexstim’s business model targets a high annual revenue stream per system with high utilisation rates, and management believe this can be achieved via the varied pricing options on offer: pay-per-use leasing, monthly unlimited use leasing, or capital sale (with additional fees from head tracker sales and servicing). Interestingly, the company has found that the NBT sales cycle in MDD is more rapid due to this pricing flexibility, especially in comparison to pre-surgical mapping where NBS is a capital purchase for most buyers. 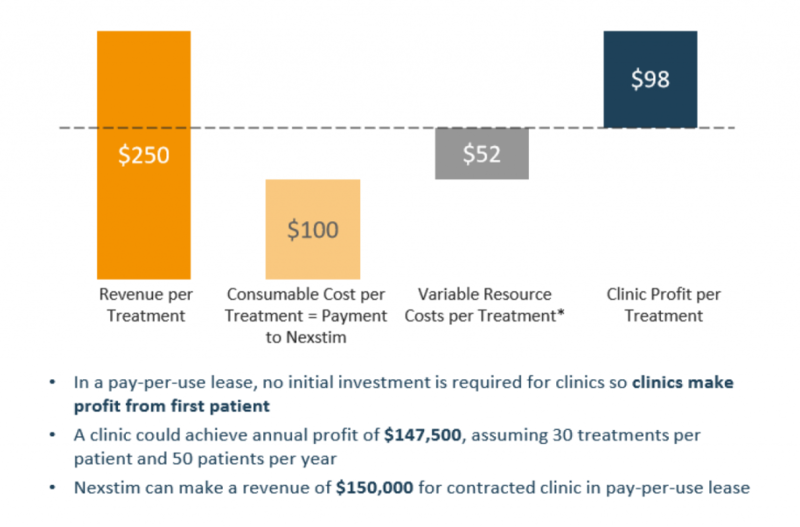 Source: Nexstim Note: * includes estimated cost of facilities and technician for 45 minutes per treatment, MD costs (3x per patient, 45mins biweekly) and MRI cost of $500/patient divided by amount of treatment. 40% overhead applied. Nexstim’s commercial approach for NBT outside the US involves both direct sales and distribution partnerships, placing systems at prominent psychiatric and neuroscience centres. Europe, the second largest global market for rTMS, is at the forefront of commercial plans, although it is recognised that the pace of uptake is likely to be slower than in the US due to more fragmented reimbursement and differing national treatment practices. Growth in patient registry data in depression (including a comparative element with non-navigated systems) will supplement the body of clinical outcomes evidence and should be persuasive in helping to change existing treatment practices and increase adoption. In established markets (Austria, Belgium, Germany, Scandinavia, Switzerland, Russia, and the UK), Nexstim’s targeted customer strategy will reinforce strong KOL networks, generate data to feed into patient registries, and generate revenues. As Nexstim’s TMS systems are CE Marked in three indications, there is also opportunity for cross-selling NBS and NBT. We note five Finnish university hospitals are already using Nexstim systems for treating depression and pain. Nexstim has identified key new markets in which it is seeking to enter and develop with motivated distributors. In Europe these include France, Italy, the Netherlands and Spain. A distributor is also sought for Canada, while the company has recently launched its presence in Asia with a specialist neuromodulation distributor. Ampere Medical has been appointed as the NBT and NBS distributor for Hong Kong, where the first system for MDD has already been installed. The CE Mark means no separate regulatory process is required for Hong Kong, although entry into China, and potentially other Asian markets, will require additional clinical trial(s). However, China partners are currently under evaluation. In parallel with investments in commercial infrastructure, Nexstim has plans to further improve the value proposition for NBT in MDD. These initiatives aim to increase effectiveness or efficiency of the therapy treatment process, and include technology enhancements (automation, advanced user interface, system cost reduction) and seeking broader regulatory approval. Recent submission of a 510(k) filing with the FDA for use of shorter therapy protocols (including the 3-minute ThetaBurst and the 19-minute Dash protocols) is an example of the latter. ThetaBurst is a patterned form of rTMS that requires less time and lower intensity to administer, while Dash involves shorter periods between pulse sequences thus compressing the overall treatment time. Shorter treatment times would mean more patients can be treated over a particular timeframe, further increasing the profitability for the TMS treatment centre. Following Nexstim’s shift to a depression-led corporate strategy, we have revised our model to reflect the company’s altered priorities. We have removed the stroke indication from our valuation and forecasts, and updated our assumptions regarding the opportunity in depression. We still view a sum-of-the-parts DCF-based methodology (including risk-adjustments for the clinical-stage chronic pain indication) to be the most appropriate way to value Nexstim. These changes result in a €35.9m valuation, equivalent to €0.37/share and €0.34/share diluted (based on in-the-money options and warrants). We continue to apply conservative assumptions regarding patient populations, market sizes and growth rates, net pricing, adoption curves, and peak market penetration. Additionally, we only value Nexstim’s visible assets with possible incremental clinical indications and off-label usage excluded. The rNPV of NBT in MDD was €44.1m (€0.45/share) when we initiated in July 2018. However, with the loss of the stroke indication, the company’s cost base is now spread over fewer revenue streams. The result is the MMD value has dropped to €21.2m (€0.22/share). This is the only major change in our model forecasts. We would highlight that our valuation only reflects limited contributions from the chronic pain indication. Looking ahead, evidence of faster than forecast adoption for MDD in any sizeable market would represent valuation upside in our model. Additionally, as before, within our model we have also accounted for the dilution from the outstanding warrants and options. The revised focus on the depression indication has implications for our financial forecasting. Clearly the loss of the potential revenues from the stroke indication is disappointing; however, it should be noted that tapping into this opportunity was not going to be straightforward and would have required sizeable investments in both time and resources. In contrast, the value of TMS in MDD is more established, with a reduced need to educate clinicians and payors. In this setting the reimbursement codes already exist, with the main challenge being to convey the benefits of NBT over alternative systems. Commercialisation in the US since FDA approval in May 2018 is progressing well and the system’s ability to navigate precisely, reliably, and reproducibly is achieving clear differentiation from other technologies. The sales cycle for NBT in depression appears to be shorter than we had forecast for the stroke indication; which probably reflects greater familiarisation with such capital purchases, the flexible pricing models on offer, and the earlier appreciation of its clinical merits. Nexstim had cash of €10.3m in June which, following the cessation of clinical work on stroke and other cost cutting, we estimate is sufficient for c12 months at our current forecast burn rates. Management has developed comprehensive plans for NBT’s commercialisation in North America and Europe and we believe additional funding is needed to achieve near- and mid-term goals in depression. The focus on NBT in stroke had also over-shadowed the NBS system. Revenues consist of sales of the NBS diagnostic capital equipment and related consumables, with its operating profit line benefiting from low marketing and distribution costs, and minimal development expenditure. The true market potential of NBS as a stand-alone product line remains untested as management has rightly focused on the development of NBT rather than the marketing of NBS, yet this is an area that we expect will possibly surprise over the coming years. Although still unclear, our forecasts suggest that Nexstim has a requirement of around €5m over the next 12 months to properly execute its commercialisation plans for NBT in MDD. Depending on the level of subsequent investment needed in the commercial infrastructure and the level of sales performance, further funds may be required: we model €15m in FY20. However, the actual amount and timings will depend on the rate of clinical acceptance and institutional adoption on the one hand, and the investments in clinical data and marketing effort on the other. Source: Nexstim, Trinity Delta Note: The accounts are produced according to Finnish GAAP. The short-term debt in FY19 and FY20 is indicative of the company’s funding requirement. Our sales forecasts do not include any contribution from indications that are yet to be approved.